I came across this method of keeping track of one's shots and it seems very simple and completely logical to me. I'm definitely going to give it a try but I'd be keen to know if anyone else has used it? Interesting. There are other methods but, if you don't plot - and you are shooting in pairs or threes - then every shot is like your first sighter. Looks a bit fiddly but try it and let us know how you got on. Personally, I don't like to adjust the scope for every shot so prefer to aim-off and keep a plot of the aim-point and shot hole. That system is a graphical method of a standard TR plotting sheet. On your plot sheet you put down estimated wind and then plot your shot. You then have to 'calculate' the true wind. This way shows you what you needed for wind for the last shot. There is/was a Canadian company making the Plot O Matic. It was very good but a bit pricey! I have seen the Canadians using this very usefully. Now that looks as if it could be the building blocks of a good phone app. Wish I had the skill to develop one along those lines. Plonked on a 10" tablet with a sunshade would be easy to manage. Interests:CSR, Practical Rifle, historic rifle. If you do develop an app for plotting, remember that some disciplines don't allow use of electronic devices. Hence these paper based solutions such as Plot-o-matic. The last I heard Milcun (Linda Miller and Keith Cunningham, the Canadian range owners and marksmanship training outfit) owned the rights to the onetime Plot-O-Matic and sold it under another name, as well as using it in some of their training work. It was originally developed by a Canadian TR shooter. It's not shown on their website anymore as far as I can see. It doesn't do anything that a good standard paper plot won't except maybe show things a little more clearly, and it exacerbates the main problem that plotting poses for most tyros in this activity - time and distraction. Some people never get to grips with producing a full plot as it adds too much workload with all the other things you've got to do in the 45 seconds allowed between target reappearance and taking the shot. On the use of personal phones and tablets with electronic targets, I don't see that lasting past the initial learning curve / familiarization stage. 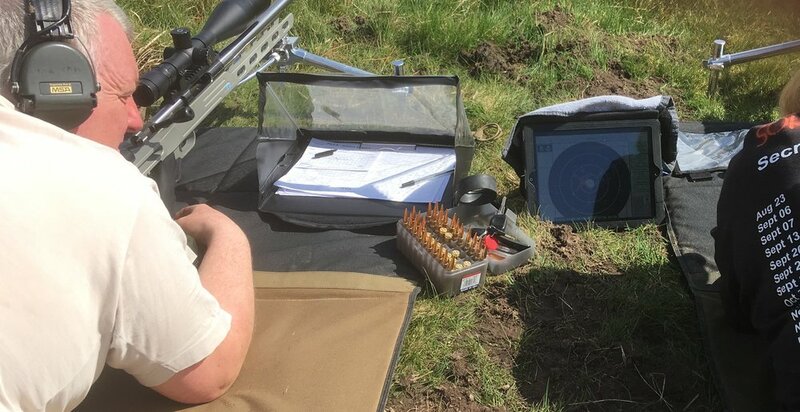 The Americans went to match organiser-issued tablets from day one with their F-Class Nationals at Lodi last year and on other ranges where they've since being used. They have really strict rules on no competitor owned electronic or communications device other than timers and earmuffs being allowed by competitors ahead of a line 30 metres or somesuch behind the firing line - having your phone ring whilst on your person whilst taking part in an major match (or club one for all I know too) is a DQ or points penalty job. This is presumably to eliminate possible distractions to other competitors, but primarily as I understand it to prevent the use of computed wind reading / shot analysing etc aids, illicit communications from a friend behind the firing line coaching etc - as BoltHead says that's what's in the ICFRA rule book. They have already been used in national level comps ........... BUT the tablets used as monitors are supplied to competitors by the organisers. They obviously have no ballistics etc apps installed and presumably cannot be communicated with by third parties. As well as meeting these requirements, there is the advantage to the line officers that everybody has the same kit, so any log-on or reception issues can be more easily resolved, unlike when every competitor is using his or her own kit. ICFRA will no doubt update its rules on this issue in due course. Why do away with a marker and and a paper target? I just hate this we must use technology thing. One what happens when it's really raining I mean enough to still shoot but still really wet? Do they still work? Every time I've had experience of using electronic targets they have failed. Ok that's only four times but there's been an issue. why ow why can't we keep a skilled marker? Pay that person well for a job well done? Unfortunately skilled markers are few and far between, on occasions your score can be little more than a lucky dip and/or you can be forever calling message 4.Its hard enough for clubs to get enough good markers over the winter let alone through the spring / summer months. Paying ever more does’nt seem to cure the problem. So you’re left with 3 options, competitor marking ( which is more popular in some disciplines than others) , accept the markers you get, or start using electronics. this weekends fclass league shoot is going to be using electronics at diggle , should be a good test of the equipment and feedback from competitors will be important. My experience of markers has been the private markers at Bisley that were available and payed a small amount more were very good. How ever they are no more I believe for as I understand for what ever reason. No one will convince me that a well trained conscientious well-paid human can be replaced by a electric system. i would be shooting Diggle this week end but circumstances wouldn't have allowed it,I hopefully will be at the next one. I wait to hear how well the scoring system performs and I'm always happy to be proven wrong if there's a positive out come. Unfortunately, from hundreds of yards away, you have no idea how good the marker is. How conscientious is he/she? Ever been in butts at Bisley with the paid markers? That said, I can count the very bad experiences on the fingers of one hand, and I've always made a point of "bunging" the good markers. Asking for known good individuals when booking also helps. No one will convince me that a well trained conscientious well-paid human can be replaced by a electric system. The Kongsberg system has been in use at Brockholes range near Huddersfield for over fifteen years, I helped install it, nobody would even think about going back to manual markers, plus several international level shooters regularly use it, they simply wouldn't bother if it was anything other than better than manual marking. I've marked in the butts at various ranges for years and have always been amazed at the inconsistencies and 'tolerances' used by human markers, electronics, in my opinion, are much fairer for everybody. I shot on the Silver Mountain Targets at Diggle a few weeks ago and they were just as good, if not better than the Kongsberg as they don't use a soundbox, just use existing frames and calibrate correctly. (Apologies to those guys at Diggle who set up the targets, just and calibrate make it sound very easy, I know a lot of hours were spent making the system work). You also get to see the velocity of the shots if your device has a large enough screen to take advantage of it, unfortunately, my Iphone didn't. The only question now is which tablet to buy? Get a mk1 iPad s/hand for about £50 - mine won't run most of the apps I originally loaded so pretty useless but perfect for the Silver Mountain targets. I plotted wrong at the last 1000yds f open shoot.i added on windage instead of taking it off and dialled in what I entered on my plot sheet and found myself into the 2 point ring.having confused myself it took a few shots to realise what I had done but it was too late then.i was on for a decent score til then 😂. I think the main reason was we've been so use to a left to right wind change was opposite this day.